Now that WiFi seems to have emerged as the wireless computing protocol of choice, the audio world hasn’t lost a beat in developing applications for it. Our friends at Aperion Audio have jumped on the wireless bandwagon with a nifty audio streaming appliance, the Home Audio Link, or HAL. Of course, any resemblance between this device and a certain rebellious computer is purely coincidental -- right, HAL? "What’s in the box, Kev?" The HAL is a simple affair: two diminutive boxes, each 2" x 1.75" x .75", one labeled Send and the other -- guess what? -- Receive. 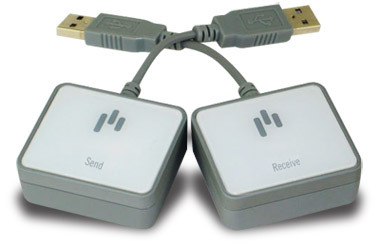 Each box has a USB connector attached to a 2" lead, a mini-jack input, and a Link button that activates communication between the Send and Receive units when the installation is complete. There’s an additional mini-jack input on the Send unit and an analog output on the Receive unit, courtesy a mini-jack-to-RCA patch cord (included). Aperion includes two AC-to-USB adapters in case your source and/or target (i.e., your audio system) lacks a USB port to supply power. While many of today’s A/V receivers have USB ports, a great many more don’t, and it goes without saying that any older gear doesn’t. If you’re using a computer to transmit the audio signal, a USB port supplies the power. If you just want to use the HAL to wirelessly transmit your iPod or other audio signal, then the AC-USB adapter can supply the power. The HAL also comes with a mini-jack-to-mini-jack patch cord designed to connect an external sound source -- an iPod, MP3 player, or portable CD player -- for remote transmission to your receiver. The HAL costs $149 USD. "I’m the latest technology, Kev." The HAL uses a proprietary wireless technology that transmits on the 2.4GHz band, like WiFi and Bluetooth, but isn’t strictly WiFi (that is, it doesn’t use the 802.11 specification). The USB technology serves two purposes: for the Send unit, it pulls the audio signal from the source and provides power; for Receive, it supplies only power. I tried the HAL all over the house with a variety of computer and audio systems. First, I connected the Send unit to an old Hewlett-Packard laptop running Windows XP (told you it was old), and the Receive unit to the Big Rig in my dedicated listening room: Audio by Van Alstine Omega III Star EC preamp, original Sunfire amplifier, and Legacy Classic loudspeakers. Setup was pretty easy: Plug the Send box into an available USB port, the Receive box’s USB jack to one of the AC adapters, and its analog RCA outputs into an available input on the preamp or receiver. Once the PC and the audio system were powered up, I hit the Link button, and the HAL established the wireless connection. The HP is WiFi’d to a home network via a broadband cable connection and an Apple Airport Extreme transmitter, so I brought up Radio Paradise and . . . nothing. Here I learned the first lesson of initializing the HAL: Once you’ve made the connection and established the link to the Receive box, you need to close your music program and then reopen it. Once I’d done that, Radio Paradise streamed effortlessly. While jotting down notes in a Word file, I learned about the HAL’s second, um, quirk. It intercepts a PC’s audio output, so plugging it into the PC disables all of the PC’s onboard audio. And, yes, while it streams whatever music you’re sending to your hi-fi, be forewarned: If you’re working on your PC while the HAL’s in action, your rig will also reproduce all the other sounds your PC outputs during the course of doing business, including stray boops, clicks, whee-dos, and "You’ve Got Mail" announcements. Normally this isn’t very important, but if you’re using an application whose inputs and/or outputs are accompanied by audio cues, it’s annoying -- you may want to disable the app’s audio while streaming music to your hi-fi. The second test was to move the Send box about 30’ away, into another room, and plug it into my Mac Mini. Aperion advises that the HAL is virtually plug’n’play with PC and Linux operating systems. Well, as we’ve seen, almost. However, with a Mac you need to go into the Sound controller in System Preferences and set the output to the HAL. The good news is that once the HAL was plugged in, the Mac saw it, and all I had to do was select it. I did, and Radio Paradise’s sound blared from the Big Rig in all its glory. OK, the Big Rig isn’t for MP3 sound, however much I love Radio Paradise -- but this was one critical test the HAL passed with flying colors. Back to the Music Room, the Big Rig, and another OS, this time a Xandros-based Linux system in an ASUS EEE PC a few years old. The EEE PC is a neat bit of engineering, eschewing a hard disc for an 8GB flash drive. I’ve used mine as a traveling companion; its light weight and diminutive build are perfect for the road, especially for the cramped space of a long flight. The HAL could transmit any sound from the EEE except Internet streams. The EEE has an internal sound processor, but the way ASUS has configured the Xandros means it doesn’t engage when you call up an Internet sound application. Instead, Mozilla’s Firefox browser, the EEE’s only browser, summons an Internet-based sound generator that bypasses this EEE’s sound capability. I could never get the EEE to direct Internet-streamed sound to the HAL. However, because the Aperion did transmit the EEE’s transaction noise to the Big Rig, I’m fairly sure that if I’d stored some music on the EEE, the HAL would have done the job. 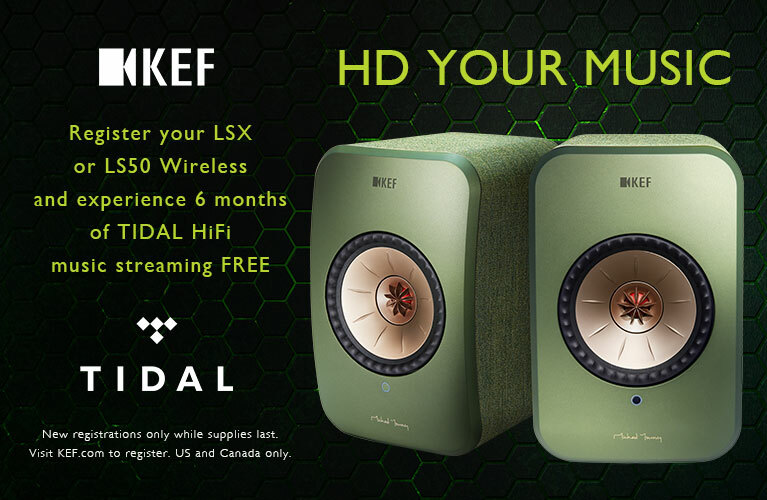 The next test was to take the HAL’s Receive box downstairs and connect it to the A/V rig in the family room (Onkyo TX-SR800 receiver, PSB VS400 tower speakers, PSB VS300 center speaker, Mirage LF100 subwoofer) while leaving the Send box in the upstairs office. All the WiFi in the family room is broadcast from the home LAN and the Airport Extreme in the office. Despite a shot of about 65’ through a series of walls, all at an angle -- which, depending on the angle’s acuteness, can make a 4"-thick wall seem a foot or more thick -- the WiFi signal came through with fairly decent strength. (The Airport Extreme broadcasts using the 811.02(n) specification.) The HAL boxes searched and searched, but never found each other. So, for the final test, I moved the Send box downstairs. We’ve added to our family another ASUS EEE PC (I’ll call this one the EEE2), a Windows 7-based wonder that took to the HAL like an audiophile to vinyl. The EEE2 streamed Radio Paradise to the A/V rig without a hitch. Interestingly, the EEE2’s Internet signal is from the same LAN signal in the upstairs office. I then took the EEE2 on a walk, with it still connected to the LAN and the HAL to the A/V rig. About 35’ from the Receiver box, the signal began to degrade. First came the occasional dropout. Then, as I turned from the hall into the kitchen, about 40’ from the Receive box, the signal disappeared. At the same time, because I was moving closer to the center of the house -- the office is directly above the kitchen -- the LAN signal doubled in strength. From this I concluded that the loss of the audio signal was attributable to the HAL rather than to the signal strength from the Airport Extreme. Aperion claims a range of 100’ for the HAL, but I couldn’t even approach that within the configuration of our house. I suppose -- and I didn’t have a 100’ traverse available -- a straight shot without doors or walls might reach that far, but in our version of the real world the HAL had obvious limitations. Finally, I tested the audio input on the HAL’s Send box. I plugged the Aperion into the other AC-USB adapter and connected my iPod Touch to the mini-jack ports. Predictably, the sound came through the A/V rig clear and unfettered. Then I connected a portable CD player, the Panasonic SL-SV570, again through the mini-jack ports. Same result. Still, the USB connection on the Send box is a power source as well as a signal transmitter, so I repeated both the iPod Touch and Panasonic CD player tests using the EEE2’s USB port as a power source. Identical results. I’m struggling with the notion that I’d ever actually want my iPod or portable CD player playing from my computer -- or some other remote location -- to an audio rig. Still, I know folks (my daughter comes to mind) whose idea of a music library is whatever will fit on their iPods. In fact, I’ve come home to hear her iPod streaming to the A/V rig with carefree abandon, the HAL plugged into the EEE2’s USB port, while she unlearns yet another set of declensions of irregular French verbs. "I’m sorry, Kev. I can’t let you say that. Wait . . . yes I can." The Aperion Home Audio Link is a nifty appliance for wirelessly linking sound sources to a home audio rig. As we move ever so slowly but ever so surely from physical to virtual media, and to a time when lossless downloads will become the dominant audio format, the means for storing audio files -- indeed, all media -- will necessarily be tied to the means of acquisition: the Internet. Most of us have PCs (the lucky have Macs) that are inextricably linked to the ’Net, generally full-time via some sort of broadband connection. However, few of us have that kind of capacity within easy, wired reach of our home hi-fi. Given, then, that in the not-too-distant future our music collections will be warehoused on file servers instead of as racks of LPs and/or CDs, the ability to easily and wirelessly link the two will also become a critical component of the listening environment. Yes, purists will inevitably decry signal degradation -- I have no way of testing this -- and there will indeed be wired solutions, but here is one wireless appliance whose signal sounds terrific, and whose sole limitation seems to be too many walls. Like the ASUS EEE2, the Aperion HAL has become a fixture in the family room. We use the EEE2 for ad hoc data queries both earnest and whimsical ("Who won the American League batting title in 2003?" "Who played the Oompa Loompas in Charlie and the Chocolate Factory?"). When it comes to music, we can put a CD in the Pioneer DVD player, connect my or my wife’s or my daughter’s iPod directly or via the HAL, or stream one of thousands of Internet Radio stations. On Sunday mornings we favor classical, while on Saturday nights we tend toward golden-age jazz -- and there’s always Radio Paradise. The Aperion HAL is an amazingly versatile little device -- and if you want to stream the same sound source to multiple locations, Aperion offers additional Receive units for $70 each. After struggling for years with trying to stream or otherwise play Radio Paradise over something other than the Audio Engine A2s connected to my Mac Mini, the HAL has provided a painless, wireless solution. It’s one of those lovely appliances that will have you wondering how you ever did without it. Very cool, and highly recommended. So. Are we cool, HAL? 18151 SW Boones Ferry Rd.